Lets you capture images of large objects, automizing the sequence and all scope movements needed for the capture. The frames will have to be merged with another software like i-Merge. 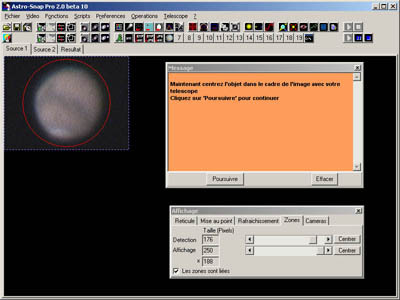 The scripts are written in a language developed especially for AstroSnap Pro : ASPSL (AstroSnap Pro Script Language). Offering over 90 commands, tha ASPSL language lets you simplify a complex operation sequence into a single one, that can be called either from the main menu or from one of the 20 configurable buttons available on the toolbar. 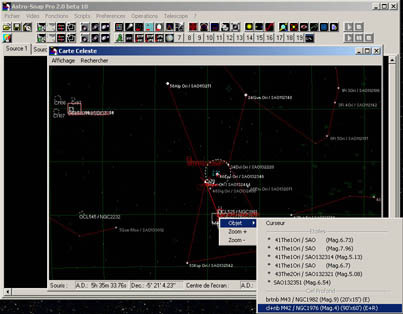 Tutorials are written in AstroSnap Pro Script Language (ASPSL), and can be used and modified by any user. 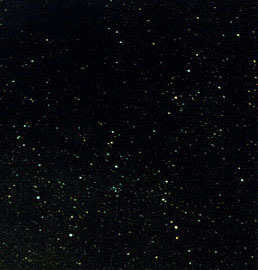 There is almost no limit to their possibilities. 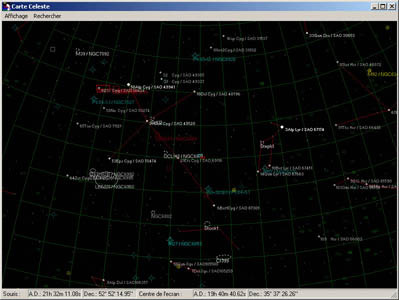 AstroSnap Pro is suitable for public presentations, with a full-screen mode. Just put your webcam on the telescope, point at a planet, start AstroSnap Pro and the software does the rest, aligning and stacking the frames, and adjusting brightness curves in real-time. 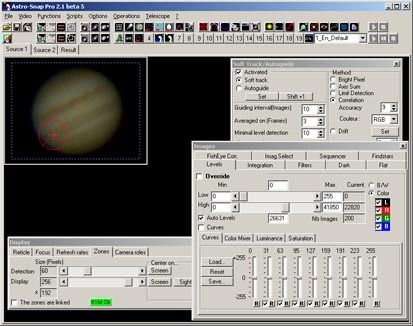 The result is immediately visible on your screen or on a videoprojector. 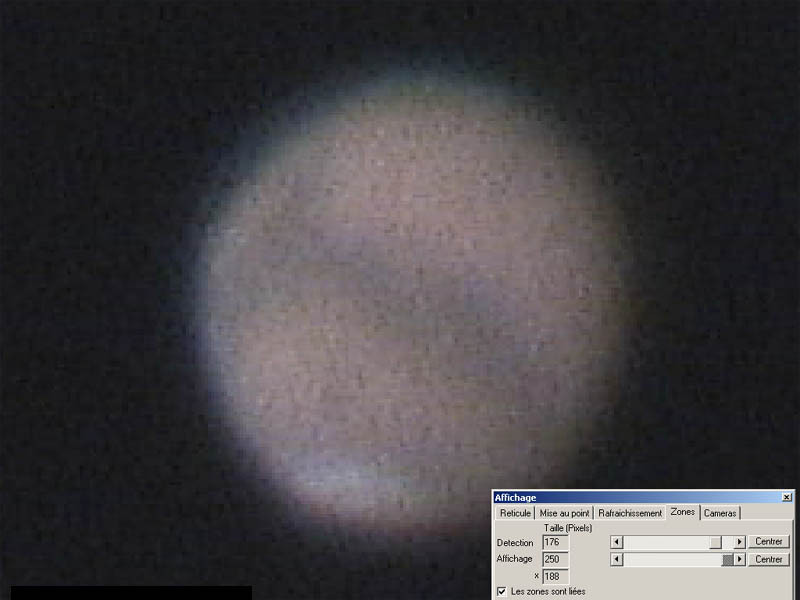 A webcam's image brightness span is too low to show dark details. 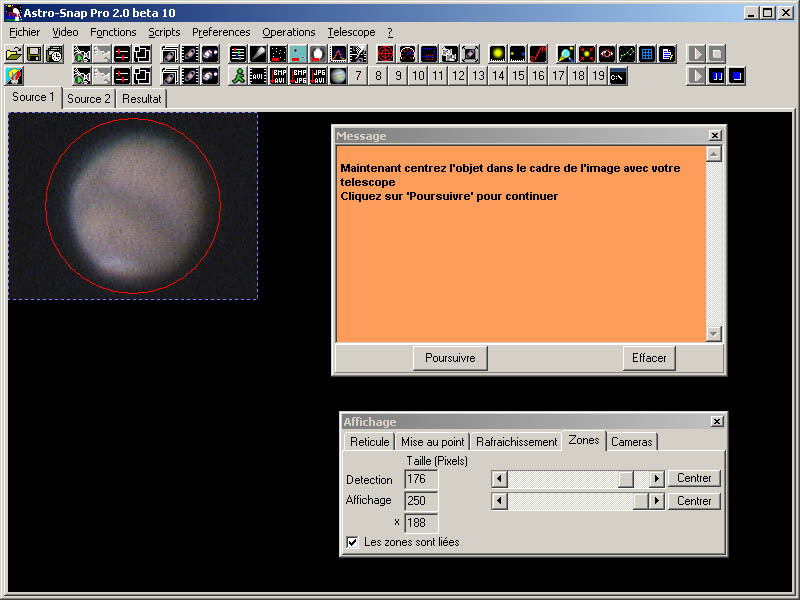 This example with a solar H-Alpha filter shows the advantage of this function. 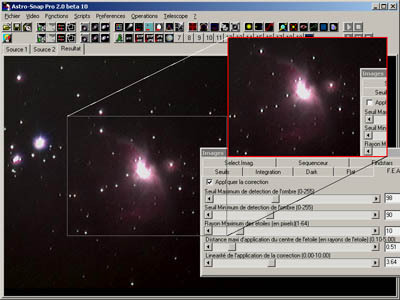 This is a "live" image captured using 3 frame loop integration mode. 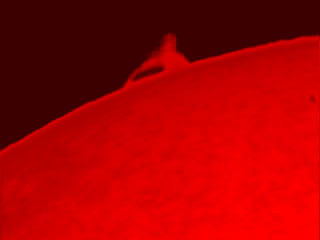 The lower light levels are boosted in order to show solar flares without burning the center of the image. You can as well completely block out the high brightness levels. 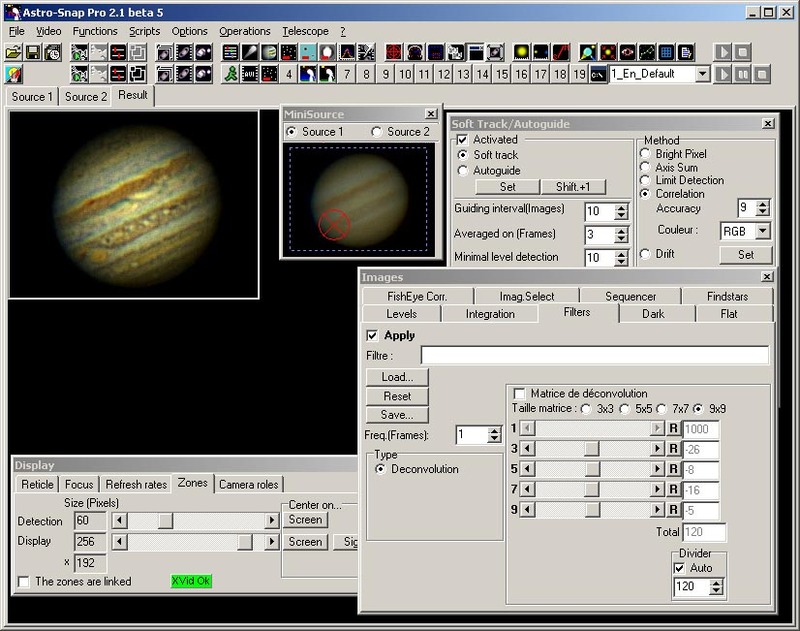 This function automatically adapts the exposure length to the quality of the mount. 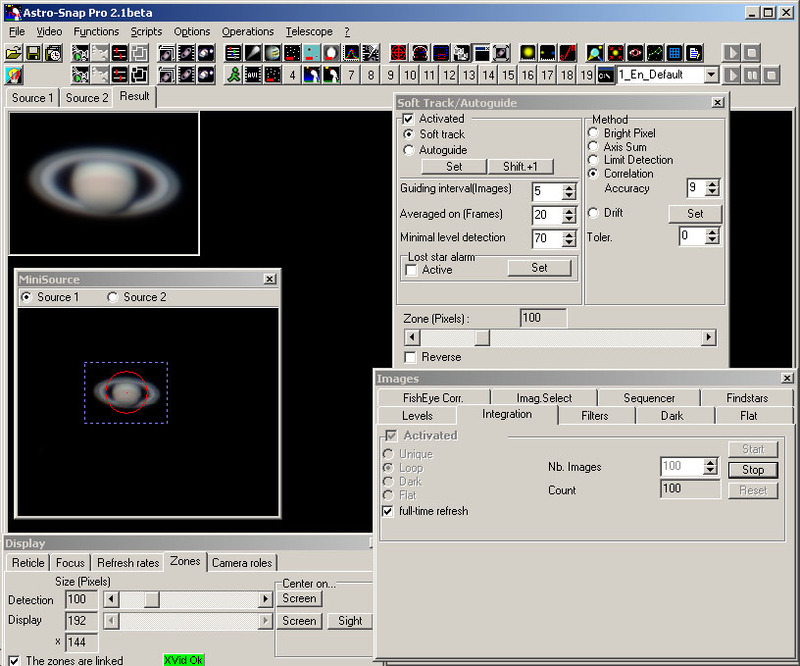 It makes sure that all saved exposures have absolutely no star trails. 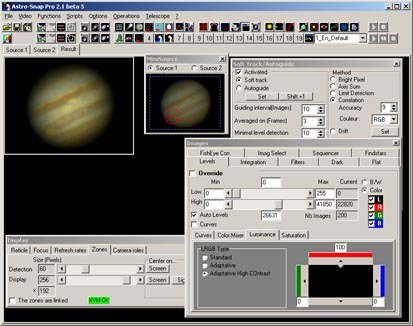 Very useful for mounts that have no autoguide capability and severe periodic error. Needs two webcams. 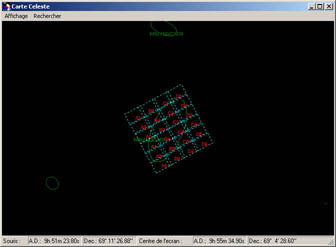 One for capture and a second one for drift detection. 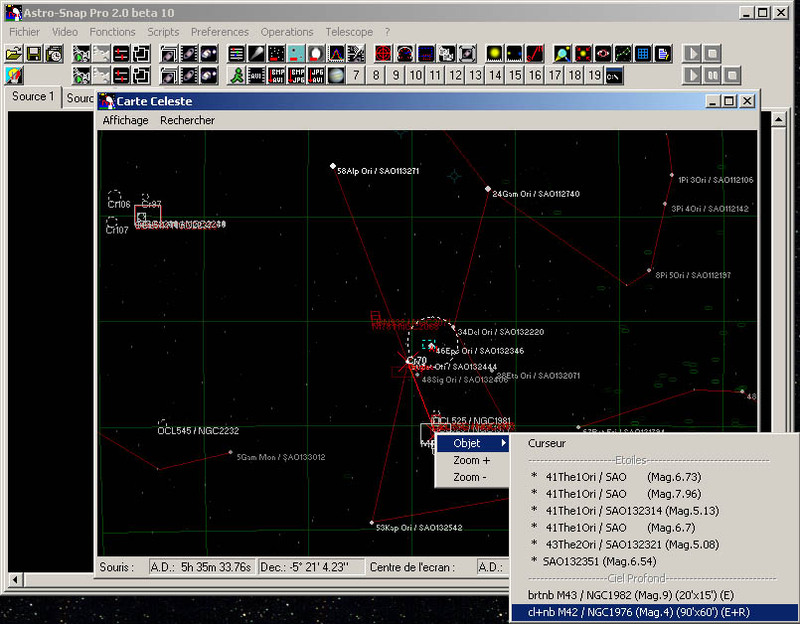 Astrosnap Pro V2.1 provides a new unique feature that gives you perfectly aligned and processed planetary images at preview time. 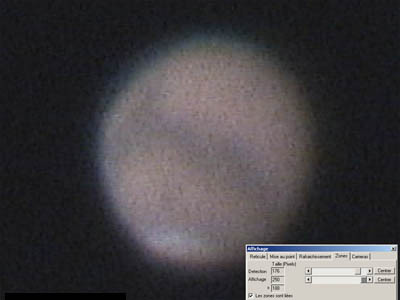 1 - The planet is cropped into a small box with the soft tracking feature. 2 - The integration feature is run in loop mode with a high number of stacked frames (between 50 and 100). 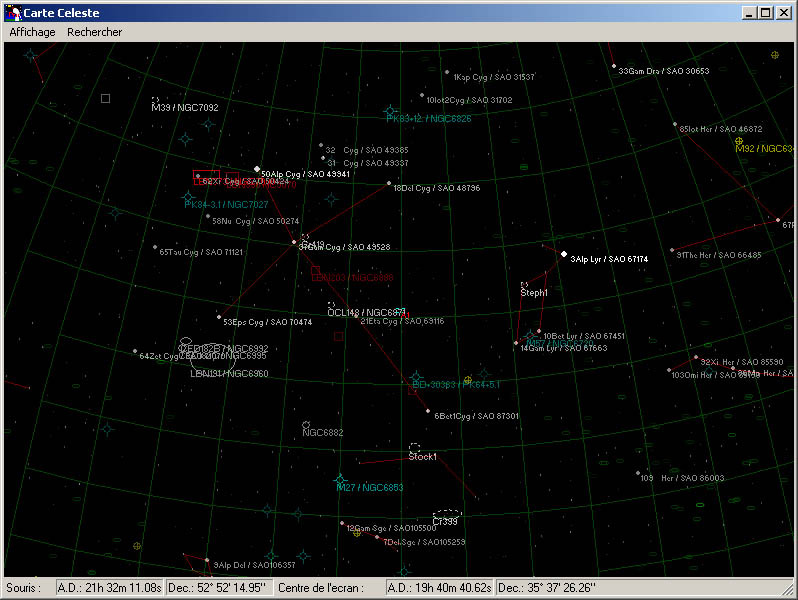 This provides a live stack of aligned frames. 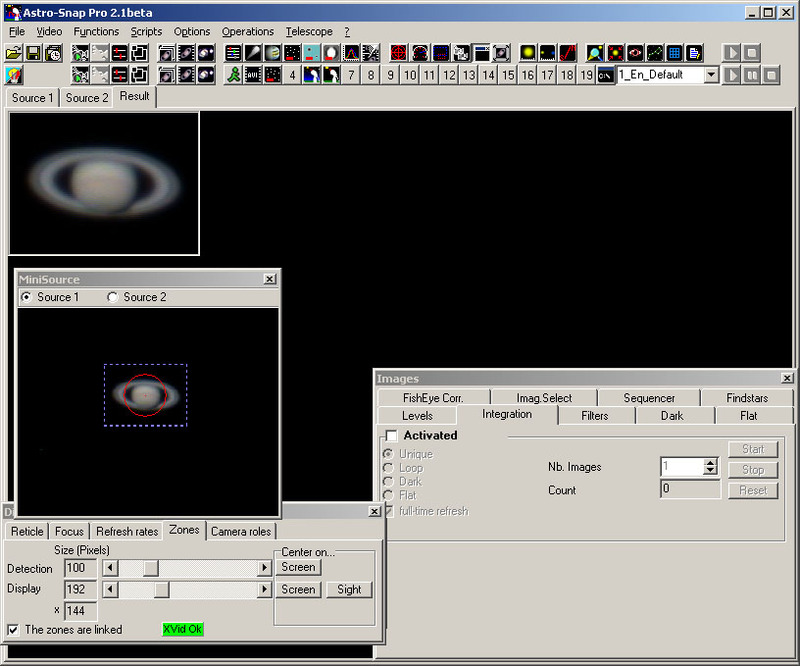 3 - And finally the resulting stacked frame is processed in almost real time with a deconvolution filter. If you apply corrections to your instrument, you can see the result live with a delay of a few seconds by activating the full screen display feature. 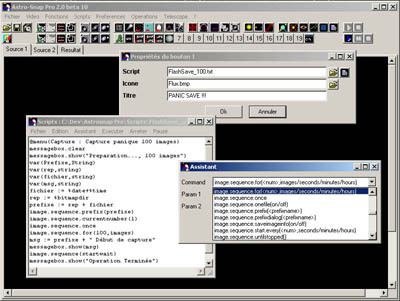 You can save the resulting images as usual, or use the sequencer. 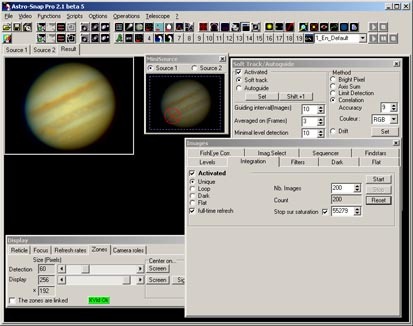 You can create videos where all frames are already aligned and processed. 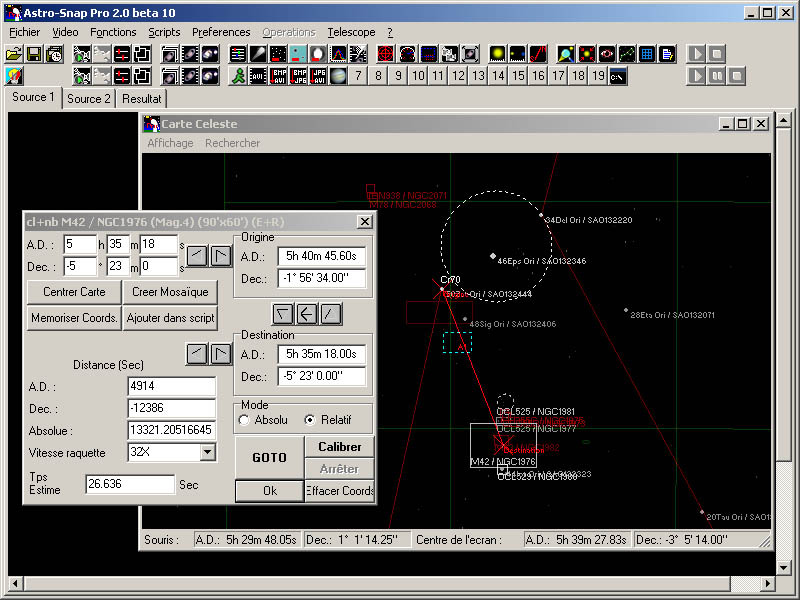 It is very interesting for events like occultations or transits (satellites of Jupiter for example). 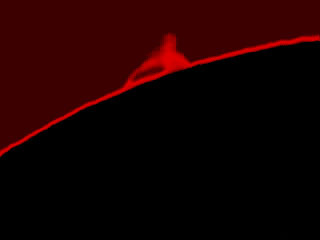 Click the image below to see a processed video. 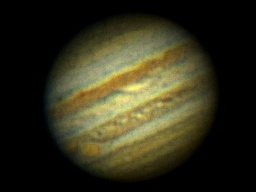 Here below is another processing example done on a Jupiter AVI file captured previously by Jean-Pierre Bousquet. 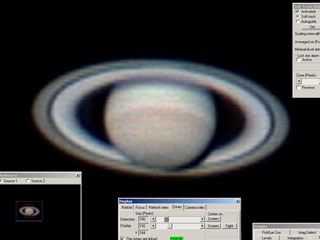 This exceptional video was captured with an Astrophysics 155 EDFS refractor in almost perfect seeing conditions. The software can process AVI files exactly the same way as if the images were directly issued from the camera.